Do you struggle with the removal of persistent stains, water streaks and dirt build-ups from your windows? Do they cost you too much elbow grease and you don't want to be involved in this housework? This task will no longer consume a lot of your time and efforts! The experts of window cleaning in Muswell Hill are willing to render you assistance! You will be able to use your leisure time as you like – the fully instructed and trustworthy professionals will take care of the washing and scrubbing. We provide impeccable cleaning services for all kinds of glass surfaces. Read on and discover more about the different advantages you can enjoy. We also provide our professional services in nearby areas: North Finchley, Colney Hatch, Cranley Gardens, Woodside Park, Wealdstone. You can always depend on our workmanship and commitment for residential and business window cleaning. Our abilities allow us to clean all types of glass surfaces you could have as part of your property. For example, you can book cleaning of single or double windows, sash ones, French doors, bay windows and patio doors. Besides that, we include conservatories and skylights as part of our routine. So to speak, you can fully enjoy the good look of your windows with our prompt and reliable services. We use advanced techniques of window cleaning to make sure you will have great end results. With the water fed pole cleaning system, jet washing and rope access team, you can rest assured that your property's windows will be crystal clear. In addition, your property is in good hands – the cleaners are fully insured and comprehensively trained. The water fed poles are attached to water supply reservoirs in the vehicles, while our rope access ensures safety – even when we clean tall buildings. You can benefit from these options immediately – dial 020 3746 3113! You can rest assured that the good look of your commercial building is guaranteed. The professionals will give you top-notch commercial window cleaning. With our water-fed extension pole equipment, you will get swift and splendid washing of all windows up to the fourth floor. For taller buildings, we employ our rope access gears. It is our efficient technique of reaching glass panes on taller structures. Regardless of what is the size of your business premise – a humble corner shop or the Shard – we will guarantee pristine look of your windows. 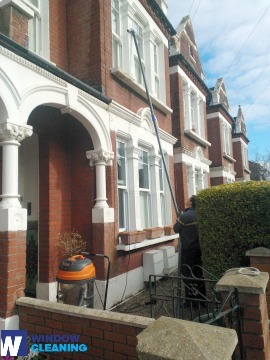 You will have absolutely clean home after the professional window cleaners in Muswell Hill deal with this task. We deliver great services for the entire London locality. The most modern ways of cleaning are included in our working practice – including water-fed extension pole system and and jet washing. You will surely see the change domestic hygiene – we use purified water for the process of in and outside window cleaning. Give us a call today on 020 3746 3113. Our customer service representatives will guide you and answer your questions. Furthermore, you can use our on-site booking from.